Cardiac magnetic resonance imaging (MRI) is a technology for imaging the heart and its blood vessels that is based on magnet fields and radio frequency. As radio waves pass through a magnetic field generated by the electromagnet within the MRI, they align the protons within the nuclei of hydrogen atoms and generate signals that are detected by the coils that surround the patient. When processed, the signals create moving pictures of the heart as it beats as well as still images from many perspectives. These images enable physicians to assess heart function as well as the structure of the heart. Cardiac MRI is often used as an alternative to invasive exploratory procedures and other imaging techniques such as x-rays and scans that require iodine-based dyes which cause adverse reactions in many patients. MRIs may also use contrast agents to make blood vessels in and around the heart more visible in images. However, many people who are allergic to CT dyes tolerate MRI contrast agents well and non-contrast MRIs can be used for patients with impaired kidney or liver function. Physicians can generally distinguish between normal and diseased tissue more easily using MRI-generated images than with images created by other technologies. Cardiac MRIs are commonly used to assess damage to the heart following a heart attack. In addition, cardiologists use them to diagnose tumors, congestive heart failure, valve disease and congenital defects. Using a cardiac MRI, physicians can detect thickening of the walls of the heart, plaque in the vessels leading to and within the heart, and changes in the size of the chambers. Cardiac MRI differs from MRIs of other organs in that it is extremely fast and is thus able to image the heart as it beats. It also uses a technique known as ECG gating to collect images at every point in the cardiac cycle. A variety of imaging techniques are used during each MRI in order to visualize different elements of cardiac anatomy and function. Spin echo sequences allow fat and scars in the heart muscle to be visualized without using contrast agents. They generate still images in which blood looks black and abnormal myocardium can be diagnosed. 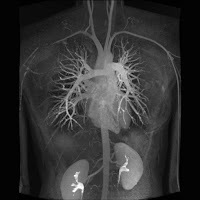 Cine imaging generates lower quality images but enables heart function to be evaluated over several cycles. Infarct imaging utilizes a contrast agent such as gadolinium to create images in which normal tissue is dark and areas of infarct are white. Perfusion defects can also be identified by techniques that utilize a contrast agent.